I haven't been really on the top of my game lately, as due to a bad infection, I'm currently spending my days at home, with warm tee on one side and antibiotics on the other. But even though I absolutely hate being sick, I feel like this kind of situations are just a reminder that sometimes we simply have to stop a little bit, take care of ourselves and let our bodies to rest and recharge. But enough about my health, I'm actually really excited about today's look, as tartan, leather and black and white combinations are probably one of the most stylish and representative fall looks, that I could honestly rock every single day! wow gorgeous look, I love that scarf, so perfect! Fabulous scarf and leather pants! You look superb in this rock n'roll outfit! I love the shoes and pants comination. beautiful look, love the scarf!!! predivno! a sal je jednom rijecju fantazija!!!! 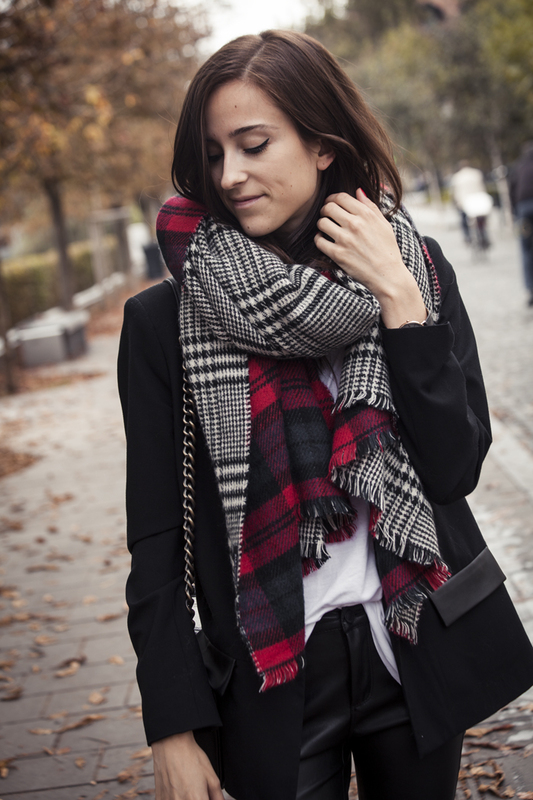 Amazing scarf, love this look! Amazing look, I love the scarf! Great blog, I have followed you with Bloglovin, if you ever get a chance to check out my blog I would be delighted, thanks! Totaly lvoe your pants and the scarf! Perfect fall look! I'm so in love with this perfect fall look that now I will try to copy it!